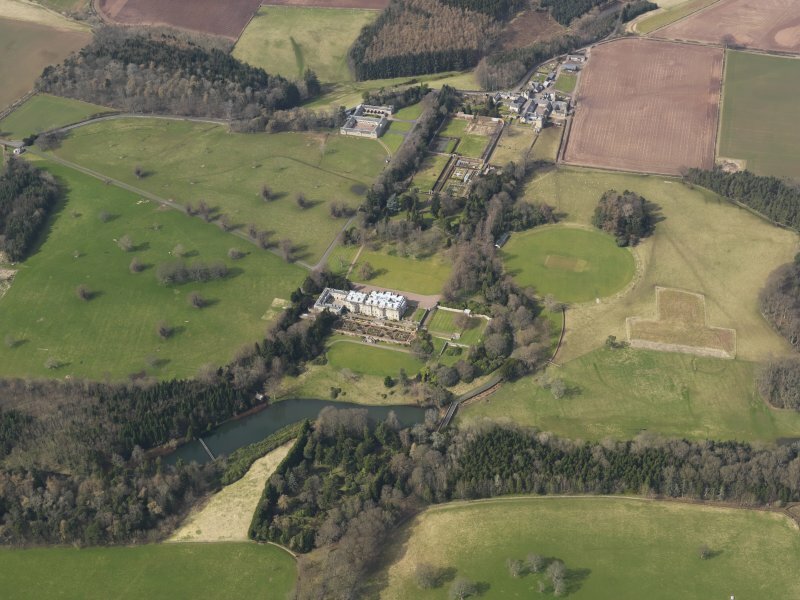 Oblique aerial view of Manderston House, looking NW. 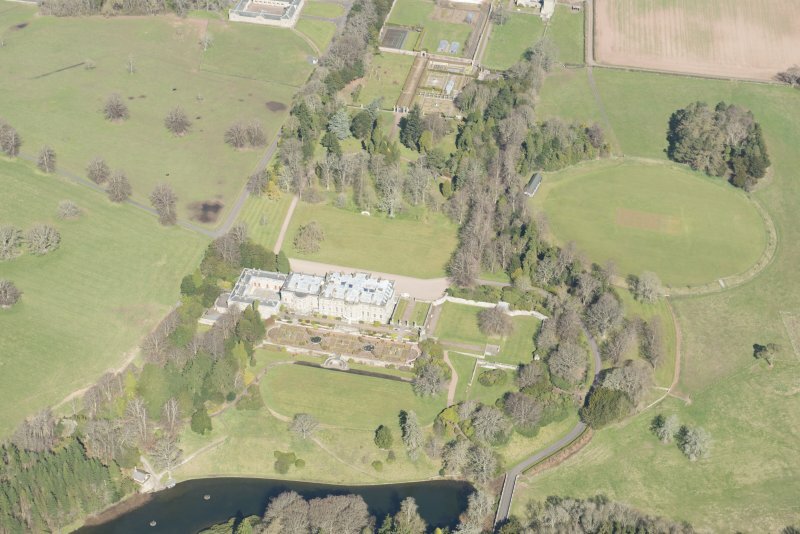 Oblique aerial view centred on the country house with the formal garden adjacent, taken from the N.
Oblique aerial view centred on the country house with the formal garden adjacent, taken from the SW.
Oblique aerial view centred on the country house with the formal garden adjacent, taken from the S.
Oblique aerial view centred on the country house with the formal garden adjacent, taken from the WSW. 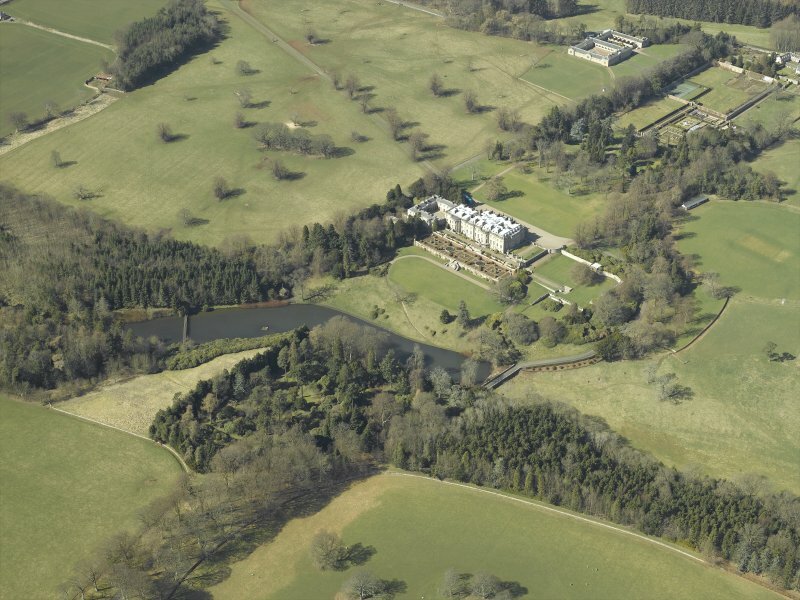 General oblique aerial view centred on the country house, garden, stable, footbridge and lake, taken from the ENE. 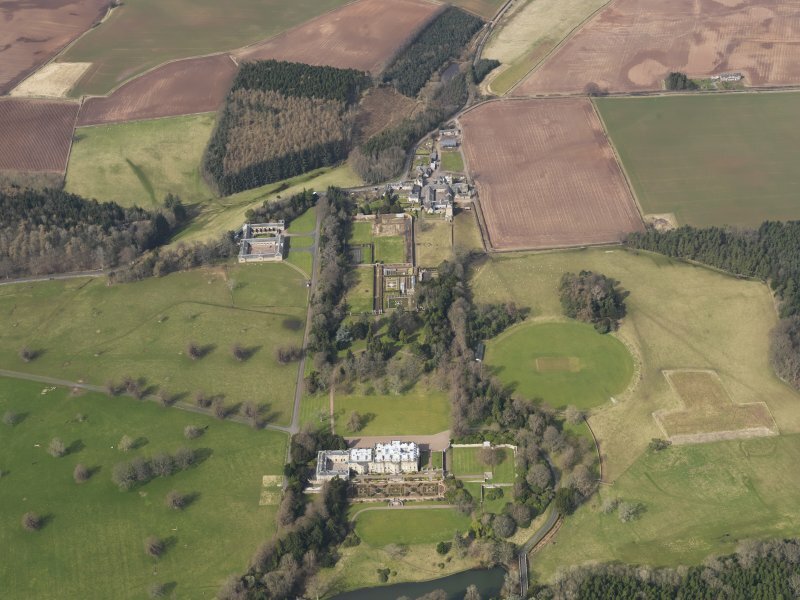 Aerial view of Manderston from South-East. 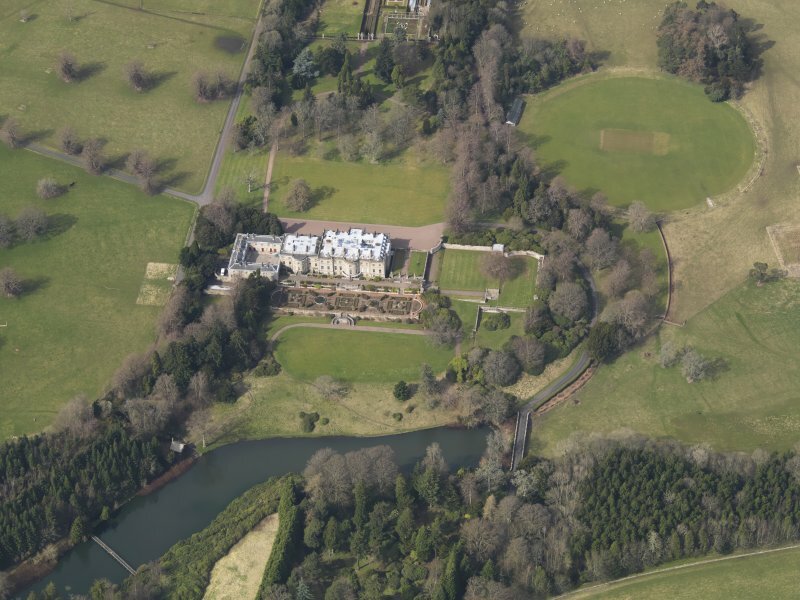 General oblique aerial view centred on the country house with the policies adjacent, taken from the SE. 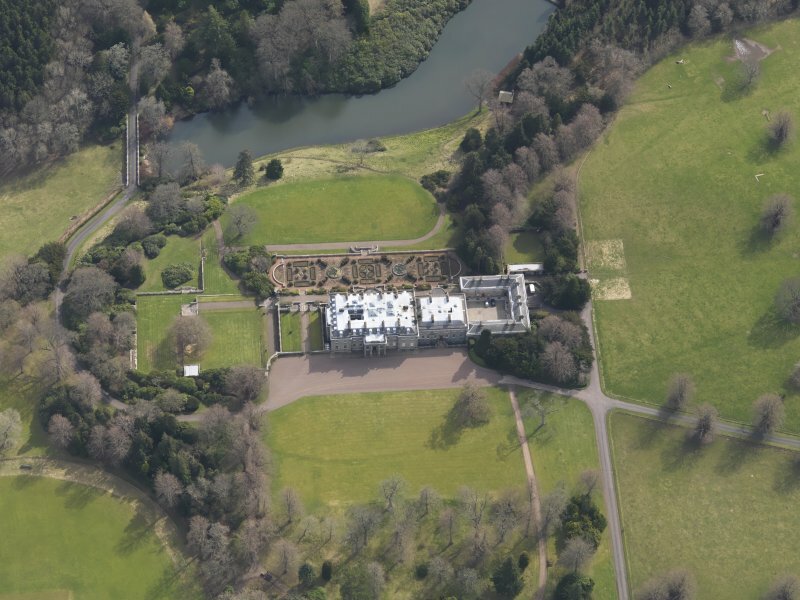 Oblique aerial view centred on the country house with the formal garden adjacent, taken from the NNW. 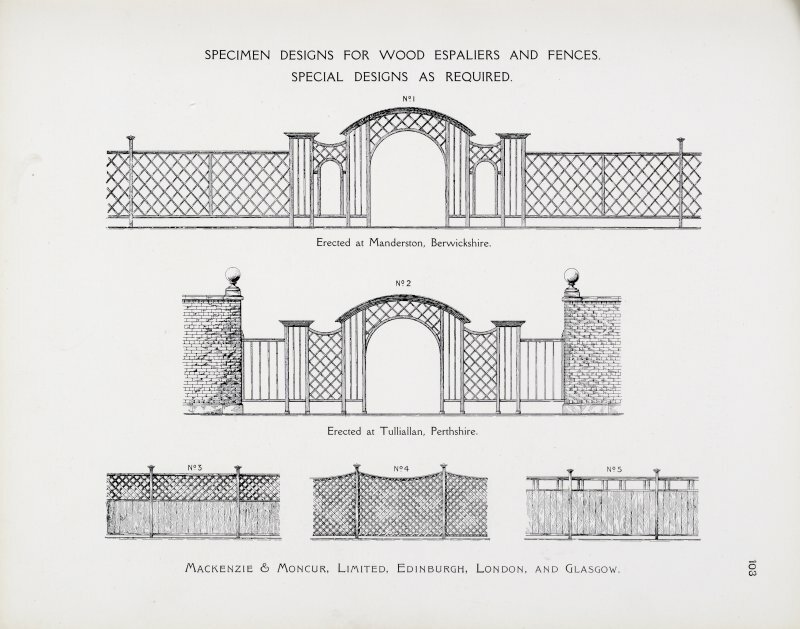 Catalogue of Horticultural Buildings by MacKenzie and Moncur Specimen Designs for Wood Espaliers and Fences - Special Designs as Required "Erected at Manderston, Berwickshire" and "Erected at Tulliallan, Perthshire"
General oblique aerial view centred on the country house, garden, stable, footbridge and lake, taken from the SE. 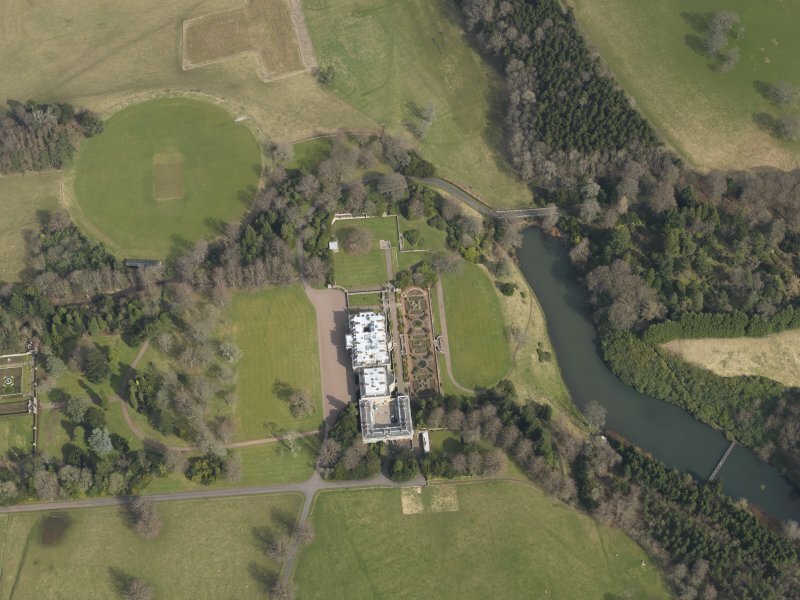 Manderston House and Lakes, aerial view. 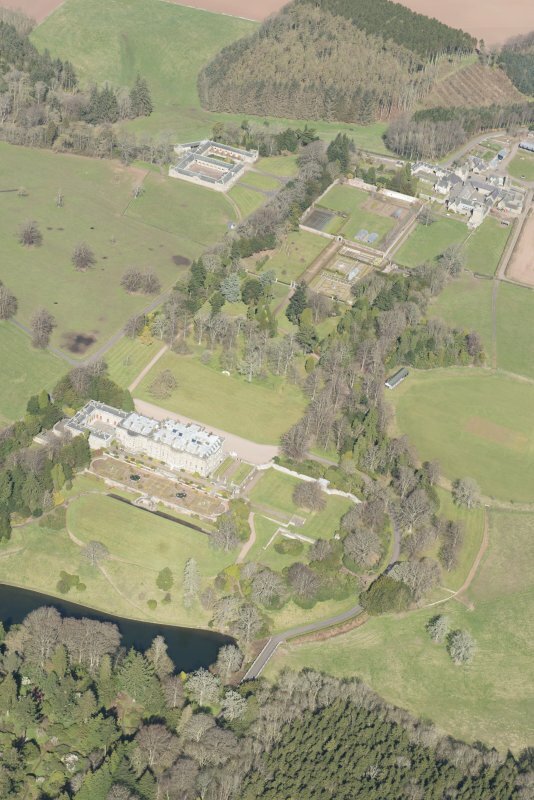 General oblique aerial view centred on the country house, garden, stable, footbridge and lake, taken from the E.
Oblique aerial view of Manderston from South-East. 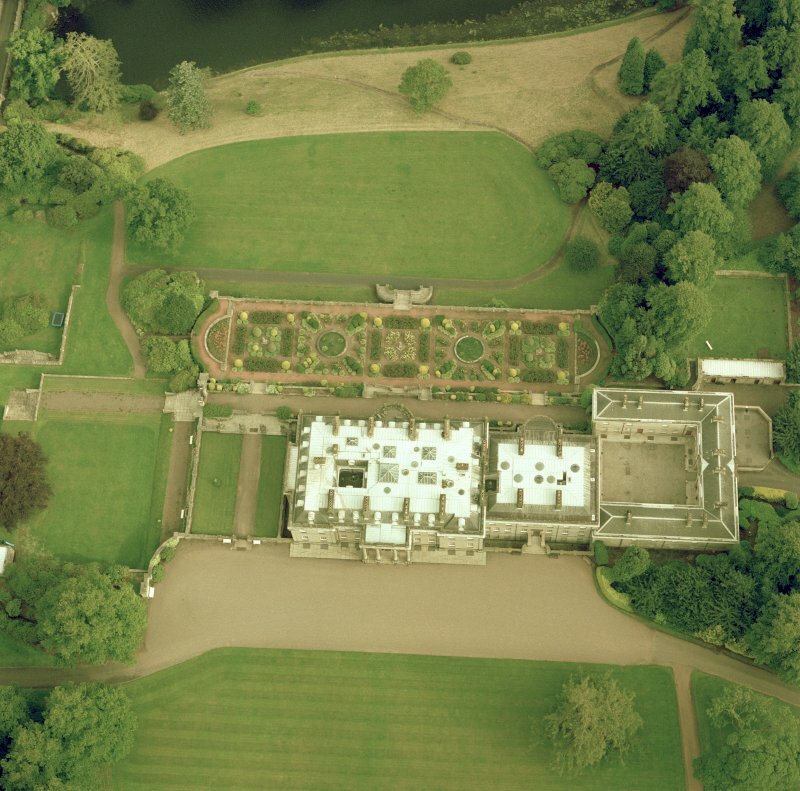 Oblique aerial view centred on the country house with the formal garden adjacent, taken from the SSW. 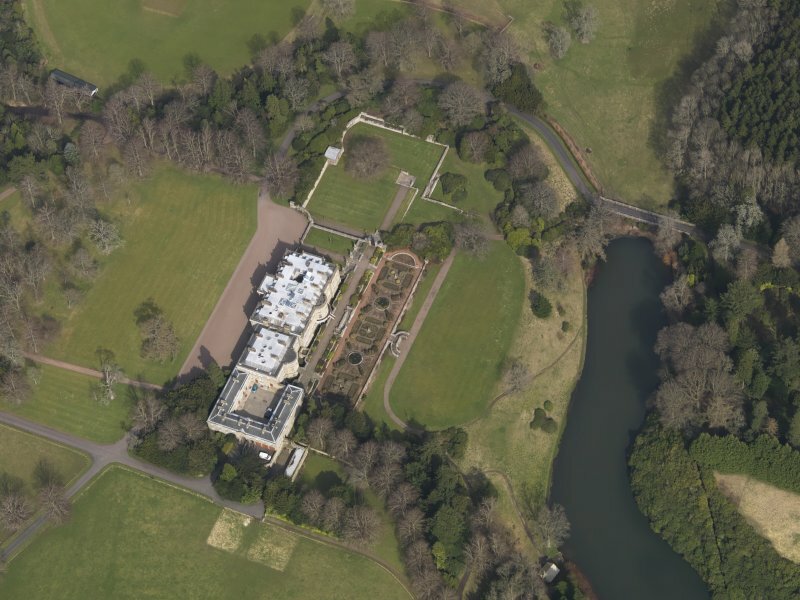 Oblique aerial view centred on the country house with the formal garden adjacent, taken from the SSE. 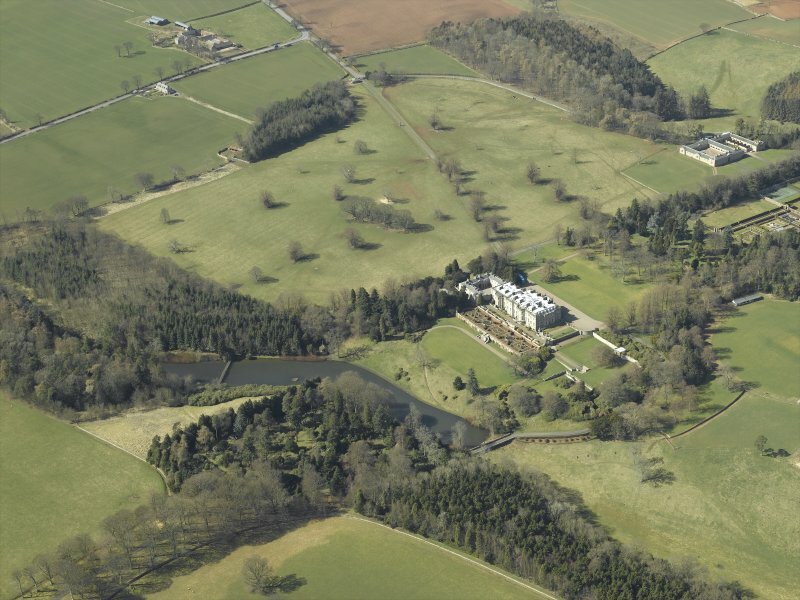 Oblique aerial view from South. 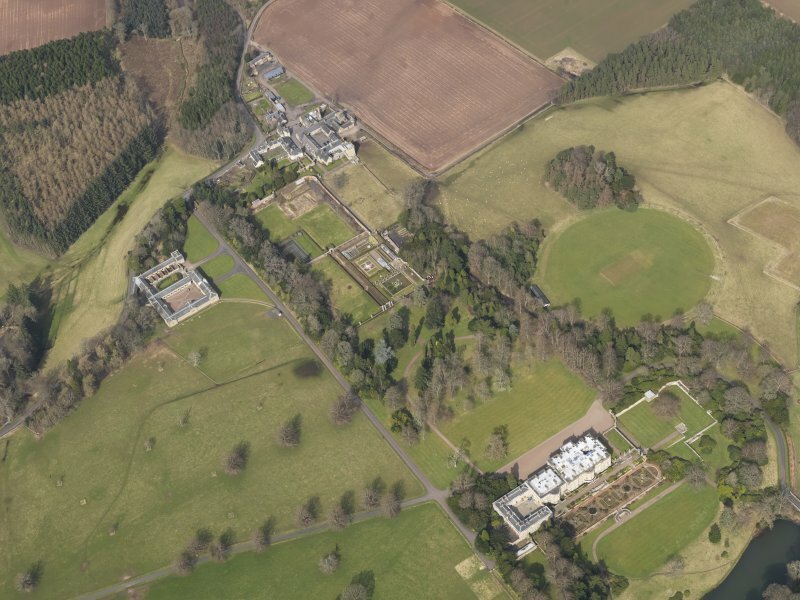 General oblique aerial view centred on the Manderston policies, taken from the SE. NT85SW 26.00 Buxley (Manderston Home Farm) and associated elements. 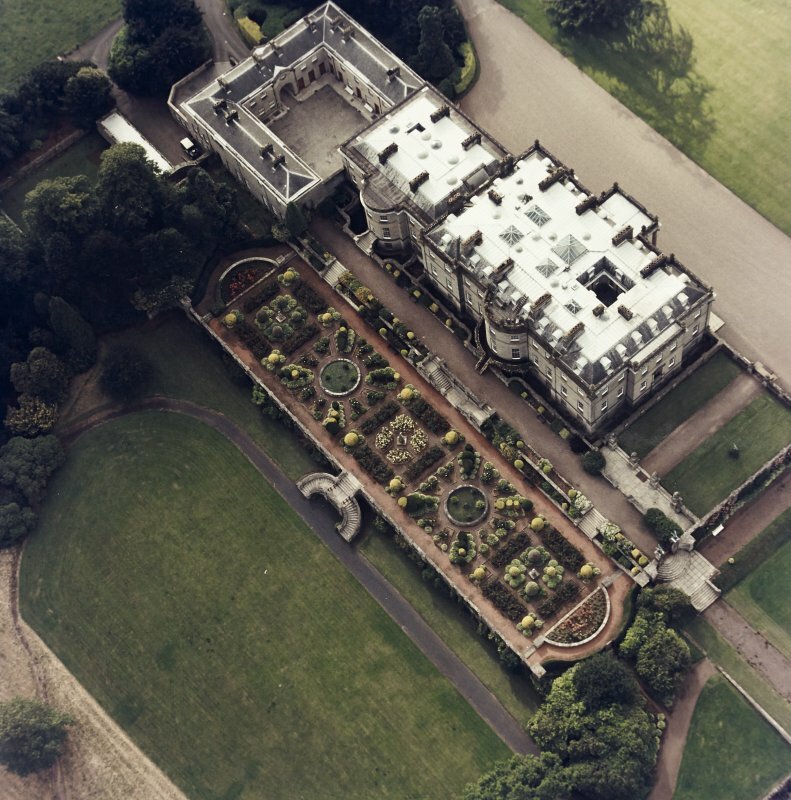 Architect: John Kinross and Harold Tarbolton, 1900. 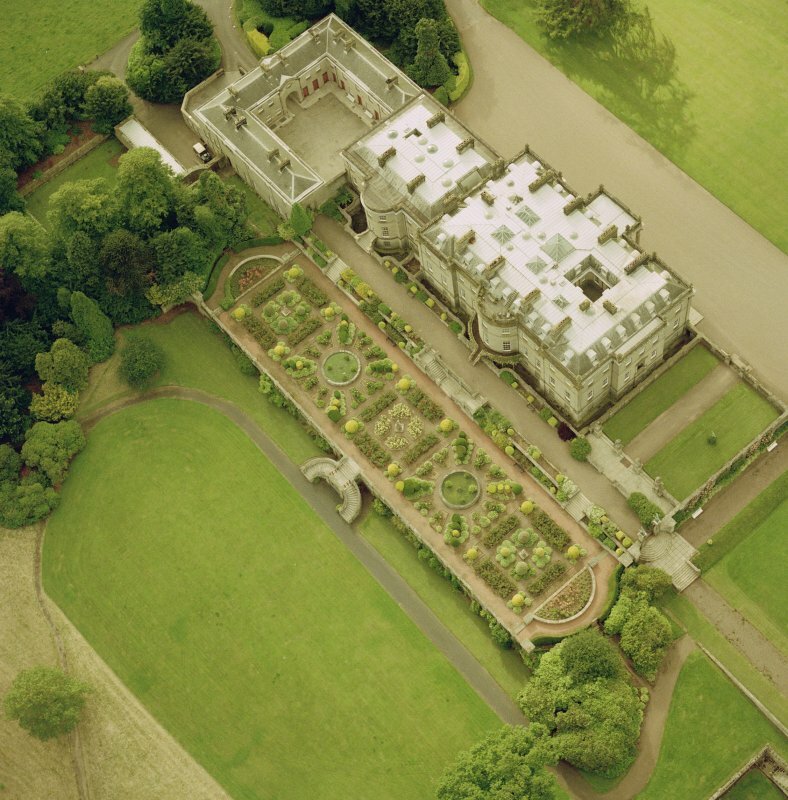 Sir William Chambers, c.1770 attributed - maybe design for Kimmerghame House. 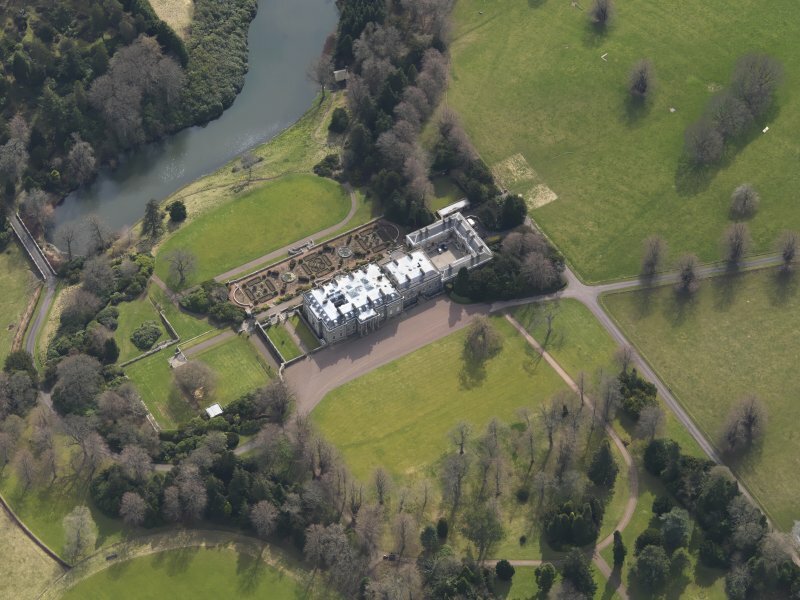 NMRS Photographic Survey of drawings for Manderston House including: designs by John Kinross 1901; designs for cottages and estate buildings 19th century designs for Hamilton House, Newmarket by G Trollope and Sons; designs for a house by A Gilkie 1789; drawings of a design for Manderston by John White 1784; plans from Greenhouses at Manderston by MacKenzie and Moncur, 1894 and copies of associated documents and contracts. 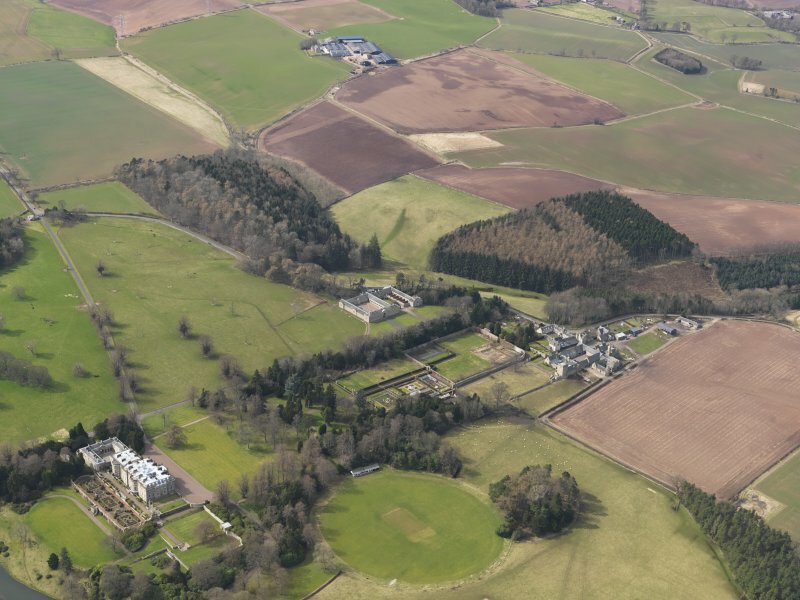 Manderston was rebuilt between 1903 and 1905-an outstanding country house designed by John Kinross, restorer of Falkland Palace in Fife and the Franciscan Friary in Elgin. Sir James Miller, whose family had made a fortune trading with Russia in hemp and herring, spared no expense-"it simply doesn't matter"! 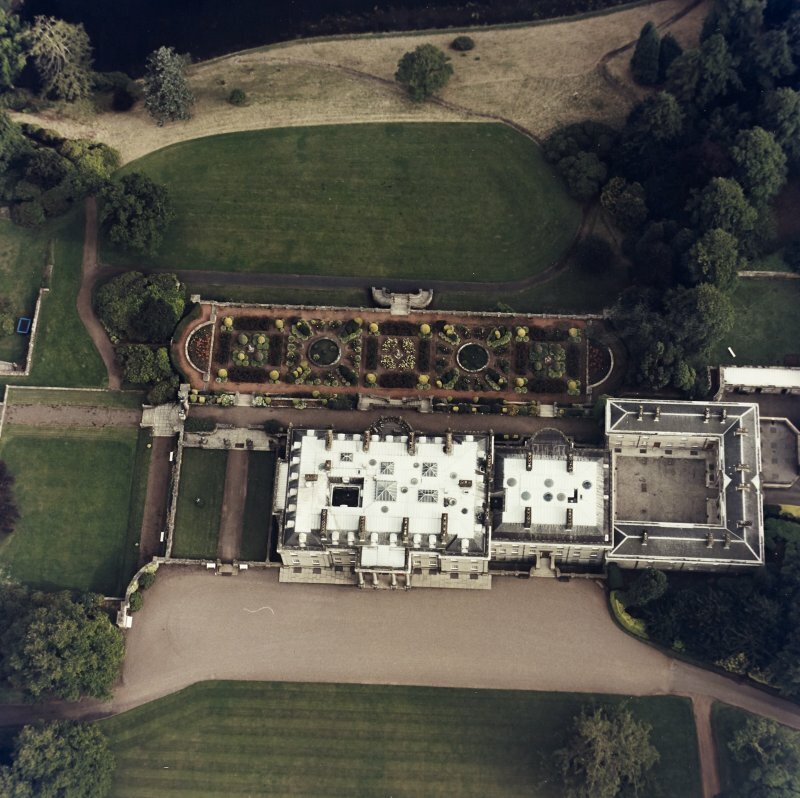 To the original Georgian House, built in the 1790s, a north front portico and rather inept French Renaissance roof had been added in the later 19th century. These were removed when the house was deepened, and a new wing and service area added along with a full-height entrance portico. 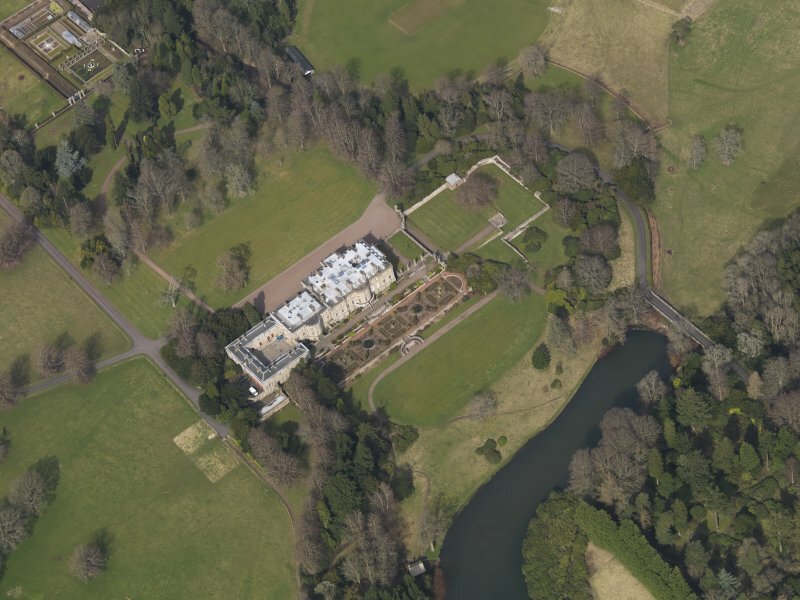 Like the earlier house, however, the present exterior betrays a somewhat severe front-though the Lion's head bellpushes in the entrance colonnade indicate a continuing flair for the idiosyncratic! 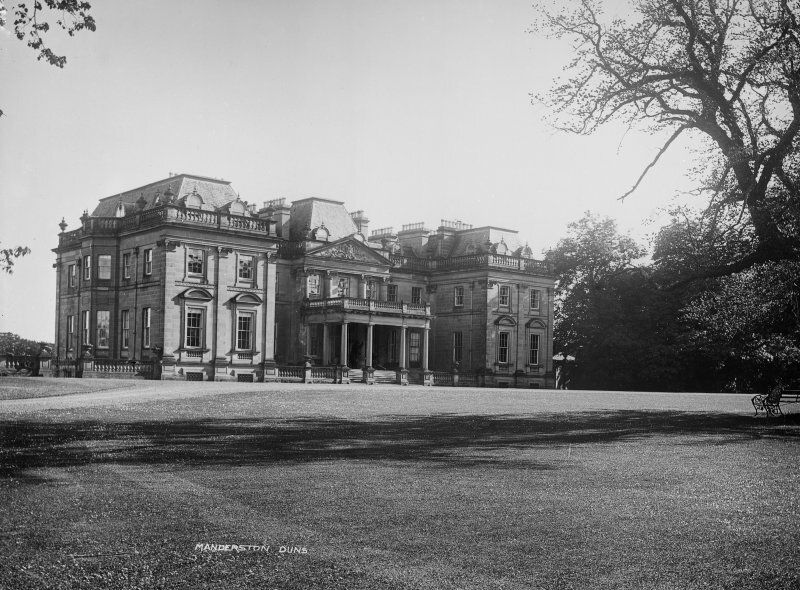 Inside, the house also continues to show a neo-Georgian face, in particular the influence ofRobert Adam who had designed Kedleston Hall in Derbyshire, the house of Sir James Miller's wife, sister to Lord Curzon, viceroy ofIndia. 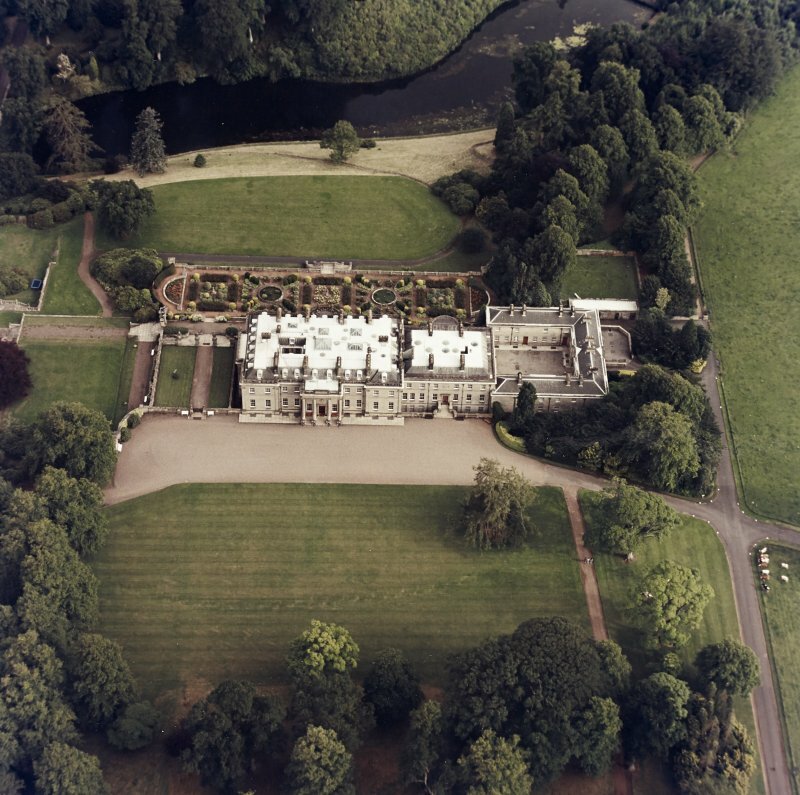 The hall, dining room, library and ballroom are all early 20th century, their fine stuccoed ceilings specially commissioned from French and Italian craftsmen. 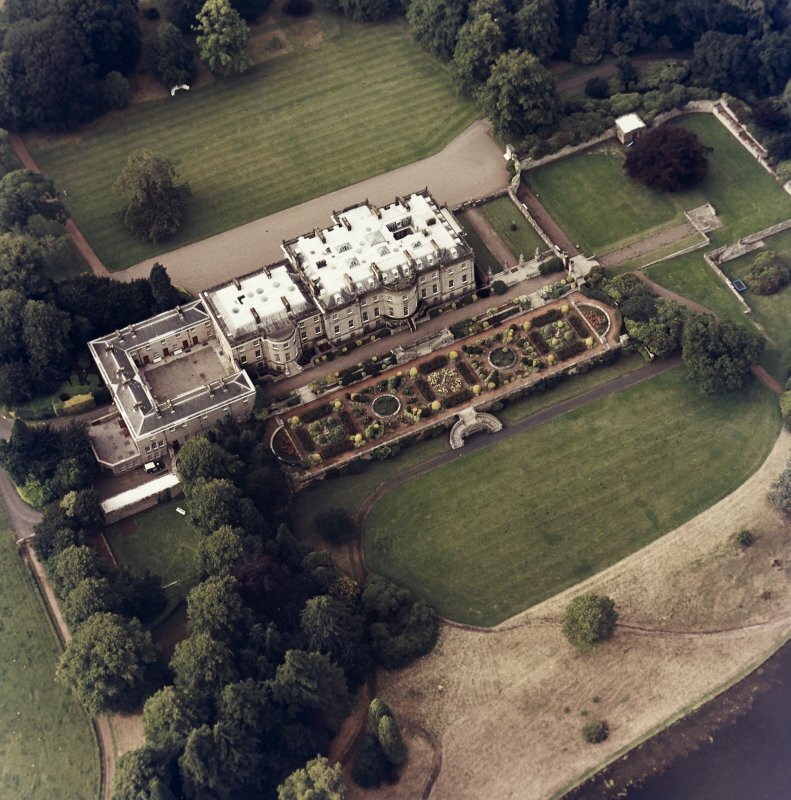 That it is difficult to distinguish them stylistically from the drawing room, morning room and tea room-all along the garden front and all part of the original late 18th century house-is a tribute to the kill of John Kinross. The first-floor corridor, imposingly wide and with columnar screens, is reached by a staircase modelled on that in the Petit Trianon at Versailles and fitted with a silver-plated balustrade topped with brass rails. Below stairs at Manderston, and true to its Edwardian sophistication, are the atmospheric kitchens, housekeeper's room and manservant's room. 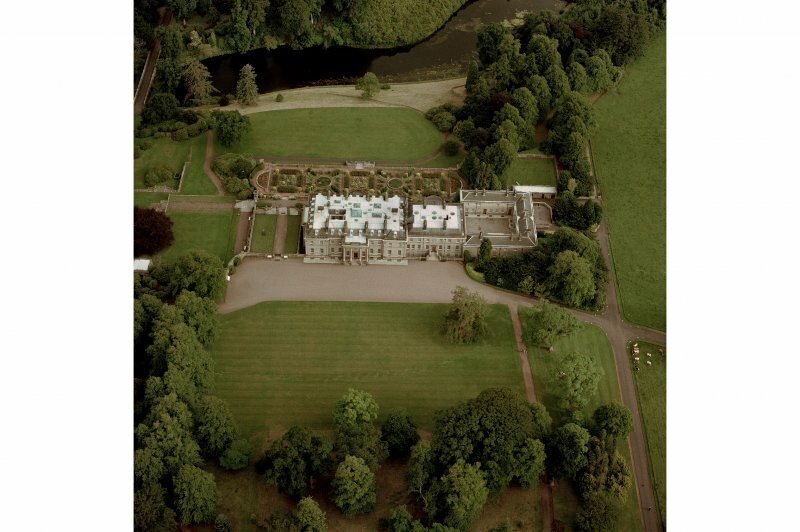 They are complemented outside, at a discreet distance, by a remarkable set of courtyard stables, 1895; also by the elegant, vaulted, marble dairy in the style of a Roman cloister set around a fountain, and by a neo-Scots Baronial head gardener's house. 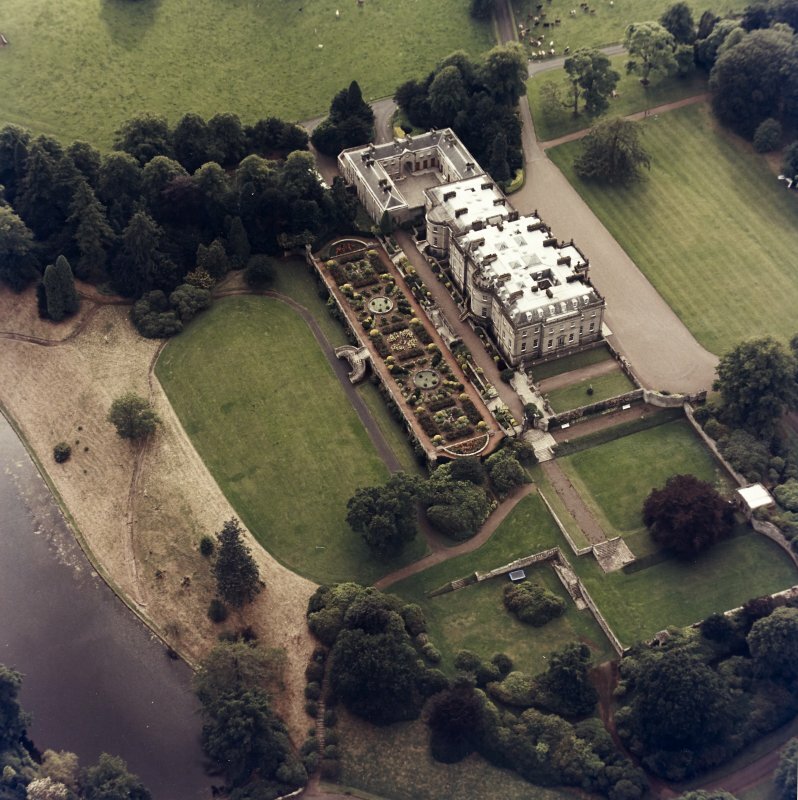 Such historical and theatrical eclecticism is echoed nearby in a mock Border tower-house-an aristocratic retreat in the manner of Marie Antoinette's rustic hideaway at Versailles. Formerly recorded in error at Manderston House (NT85SW 24). 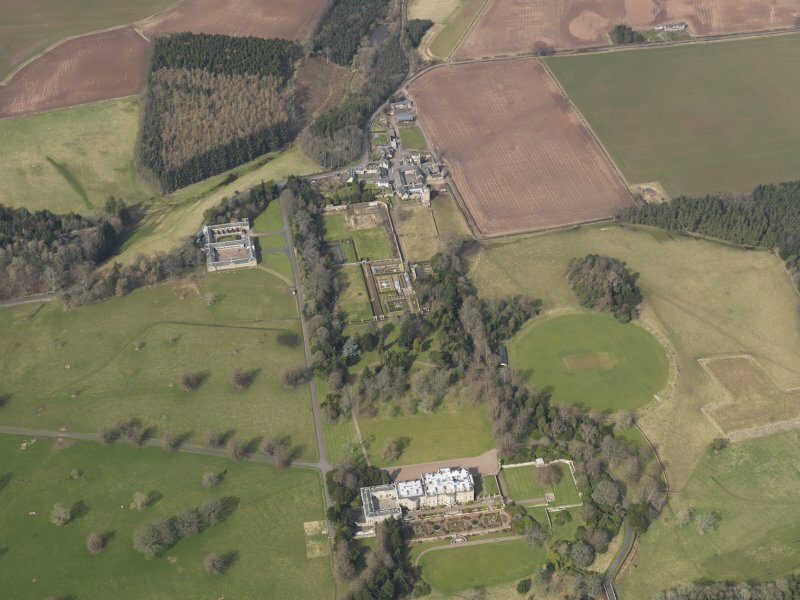 A hospital was established overlooking Coldingham Sands at the house called 'The Mount' and was called Manderston Auxiliary Hospital. 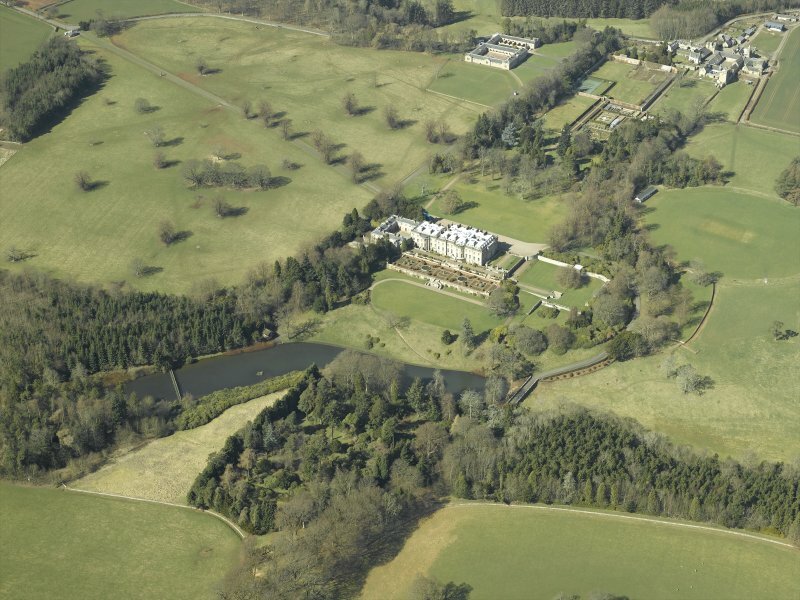 The designed landscape was originally laid out before 1750; it was added to in c.1790 and 1850 and also in 1900 by John Kinross who designed the terraces and laid out the formal garden.